The White Train took a detour from it’s regular track and field routes and crossed the Yarra to test out the brand new Lakeside Stadium in Albert Park for Round 7 of AV’s Shield competition. Athletes came from all over the North West Region to test out the new blue track and have a look around the new home of athletics in Victoria. MUAC took a strong contingent of athletes. 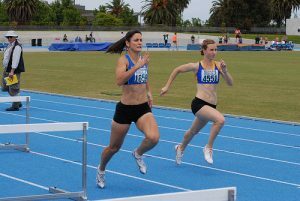 The MUAC Women fielded full teams in the 800m (Rachel Painter, Sarah James, Kate Scarlett and Jenny Than), Shot Put (Kath Clarke, Carmen Deane, Olivia Cameron and Kate Scarlett), Pole Vault (Jacquie Sharples, Kath Iannello, Dawn Hartigan and Jessie Layman) and 4x400m relay (Kath Clarke, Rachel Painter, Olivia Cameron and Kate Scarlett). Reuben Kosgei, Sydney 2000 Olympic gold medallist was a little too quick for a full squad of MUAC men in the 5000m (Hamish Beaumont, Matt Irons, Emil Gundesen, Liam Morgan and Tony Brain). The team also turned out in full force in the 800m (Jordan Mayston, Brian O’Donoughue, Nic Browne, Frank Ciancio, Leigh Goedecke, Tim Thomas, Liam Morgan and Hamish Beaumont), High Jump (Mitch Mackenzie, John Peavey, Julian O’Donnell, Peter Hoggan, Matt Irons, Emil Gundesen and Frank Ciancio) and Shot Put (Seamus Hayes, Aaron Page, John Peavey, Matt Irons, Emil Gundesen, Frank Ciancio, Leigh Goedecke and Nic Browne). Great individual performances came from Kath Clarke with a win in the 200m (26.04), Jacquie Sharples winning the Pole Vault (3.30m), Sarah Emons claiming the 5000m (18:42) and Mitch Mackenzie taking victory in the High Jump with a leap of 1.95m. Many thanks to team photographer and keeper of The Rules Ben Franzi.